In a world in which media images of crime and deviance proliferate, where every facet of offending is reflected in a ‘vast hall of mirrors’, Framing Crime: Cultural Criminology and the Image makes sense of the increasingly blurred line between the real and the virtual. Images of crime and crime control have become almost as 'real' as crime and criminal justice itself. The meaning of both crime and crime control now resides, not solely in the essential – and essentially false – factuality of crime rates or arrest records, but also in the contested processes of symbolic display, cultural interpretation, and representational negotiation. It is essential, then, that criminologists are closely attuned to the various ways in which crime is imagined, constructed and framed within modern society. 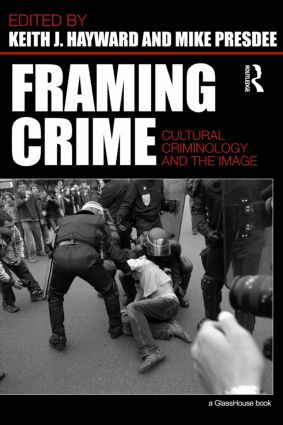 Framing Crime responds to this demand with a collection of papers aimed at helping the reader to understand the ways in which the contemporary ‘story of crime’ is constructed and promulgated through the image. It also provides the relevant analytical and research tools to unearth the hidden social and ideological concerns that frequently underpin images of crime, violence and transgression. Framing Crime will be of interest to students and academics in the fields of criminology, crime and the media, and sociology. The scene of the crime: Is there such a thing as ‘just looking’?